Founders Memorial Library presents “Sounds of Austronesia: Boat lutes, Zithers, and Bamboo Nose Flutes of Maritime Southeast Asia, Madagascar, and Oceania” through April 30. Austronesia is a region of the world based predominately on a linguistic and cultural framework. Encompassing much of maritime Southeast Asia and the Indian and Pacific oceans, the Austronesian diaspora is thought to have begun approximately 6,000 years ago on the island of Taiwan when groups of Austronesian speakers began migrating and settling the various islands throughout the Indian and Pacific oceans. The Austronesian heritage of these people still exist to this day, and their relationship to one another can be demonstrated through their traditional musical instruments. The boat lute, zither and bamboo nose flute are more commonly found within the Austronesian diaspora than in other parts of the world. 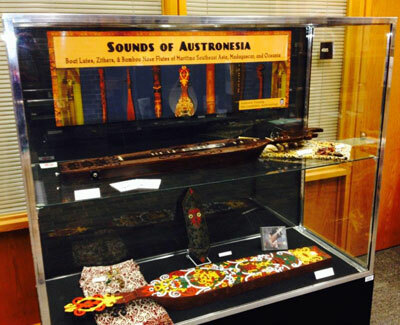 “Sounds of Austronesia,” displayed on the Southeast Asia Collection Display Cases on the fourth floor of the library, aims to highlight early instruments that were prevalent amongst Austronesian speakers. While the three instruments presented in this exhibit are not found in every island of the region, they do exist in various pockets of Austronesia and provide some insight into the migration patterns of these people through time. NIU exhibit curator Anthonie Tumpag sees great benefit to continue nurturing these bonds. Tumpag will speak about the collection at 8:30 a.m. Saturday, April 11, in Room 173 of the Music Duilding during NIU’s 2015 World Music Symposium. This exhibit comes to Founders courtesy of the staff of the Donn V. Hart Southeast Asia Collection.